I know that some of you will be reading this with your neatly arched brows raised in curiosity at just what on Earth could be considered “terrifying” about eyebrow hair. The rest of you (more normal types) will be reading this, twirling your brow hairs around your index finger. Left to their own devices, mine grow like wildfire – and I’m not talking Cara Delevingne grandiose brows here; more… Dennis Healy. Given an extra coat of brow set, you could zip wire from here to Lands End on one of mine. This ultimately means that I take the business of beating them into submission seriously. I’ve stopped shaping them myself because, like a two-year old with a biro, I simply cannot be trusted with a pair of tweezers and a magnifying mirror. Instead, I get them threaded every 5/6 weeks and this is enough to keep the arch well-defined. Preventing them from thereafter developing into McDonald’s ‘golden arches’? Well that bit’s up to me. 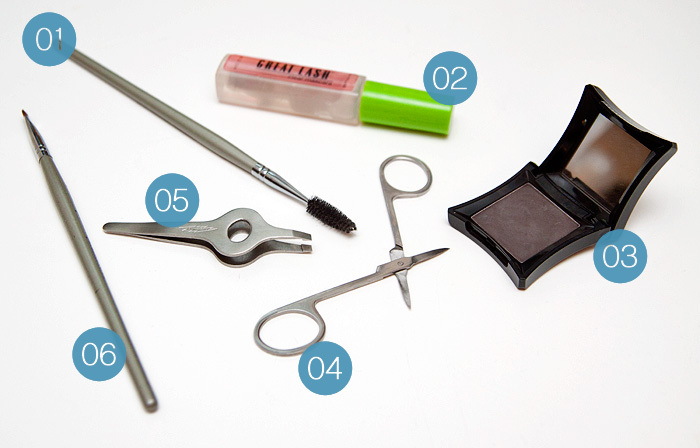 These are the brow tools that I simply couldn’t live without. 01: Mascara Spoolie. You can either buy these as purpose-built cosmetic tools or (more thriftily) clean an old mascara wand and use that instead. Either way, a spoolie is an absolute necessity in the fight against unruly brows. Comb through the stragglers before snipping and brush them into place before filling. 02: Brow Set/Gel. You can buy brow set products but I use a clear mascara. The Maybelline Great Lash in clear is perfect for the job because it holds the hairs in place without making them feel crusty and it doesn’t leave behind a telltale ‘wet look’. 03: Brow Powder. Much easier than pencils in my opinion. My holy grail is the Illamasqua Brow Powder but the most important thing is to find a good shade match in whatever you use and unless your brows are naturally auburn, beware of warm-toned browns. Many women use eyeshadow… any powder is fine. 04: Sharp pair of eyebrow scissors. These are nothing special, I bought them years ago off eBay but they’re brilliant. Super sharp with a precise point that trims the hair without pushing them ineffectually along the blade. Always brush the hair upward toward the hairline and trim any that stray outside of the bulk of the brow area. Go easy, you can always trim more but you can’t stick them back on! 05: Tweezers. I favour the brand Tweezerman for my tweezers, particularly the wide-grip style. There’s nothing more frustrating than a pair of tweezers that fail to pluck. Particularly when you’ve psyched yourself up to grab an eye-watering one only to find that the points have clutched at nothing more substantial than air. Don’t be afraid to attack anything that looks like it may contribute to a mono-brow or those random ones that appear to be sprouting far closer to your eyelid than your brow-line. 06: Angled Brow Brush. A fairly stiff brush is best for running the powder through the brow area. Always start filling-in from the middle of the brow to avoid depositing too much product on the inner third. Unles you’re going for the scouse brow/Katie Price look – in which case, just dispense of the brush and grab the nearest Sharpie pen. Also, get off my blog. What steps do you take to keep from tripping over your eyebrows? Do you thread and then leave them be or are you a serial tweezerer? You know I am a fellow brow obsessive, I think I’d probably rather have an awful hair cut than muck up my brows. Well, almost. I am still using a pencil to colour in the bits that are missing but increasingly am coming round to the idea of using powder. I love the clinique super fine pencil because the application is more precise than I imagine a brush would be, based on nothing having never tried brush and powder. I brush mine into place with a baby tooth brush rather than a spoolie, then pencil in, once pencilled in I dob my brows with my translucent face powder to set my colouring-in and it seems to work, doing my brows takes longer than doing all the rest of my make up! Biggest difference I have made to my brows recently is to have them tinted. It has transformed how they look – I have a lot of grey brows, mainly on the inner corner and for years I was so appalled by them I pulled them out. I know! Total bloody idiot. I am now coaxing them back into life but having the ones that are there tinted has made a world of difference. At the same time mine were waxed and threaded into shape & I have now vowed to keep up with the tint & shape routine until I have sufficient brow hair to warrant HD brows, which are my dream!! In their natural state, I have Brooke Shields brows… I have them waxed once a month, and then the rest of the time I pluck/retouch them myself. They’re naturally black, so I don’t need powder or pencils, but tweezers are a must for me. I don’t need to fill my brows, they are thick and dark enough without me adding to them! I currently wax mine once a month or so but the best result was when I had them threaded, but thanks to a horrendous scab in the middle of my brow that was given to me, I have yet to brave another session! But really must find a decent place! Argh! I feel your pain! I am of Indian descent and consequently have very dark and very enthusiastically growing eyebrows that tend to turn me into Frida if not tended to regularly. I get really lazy with them, have a terrible pair of tweezers and a distinct lack of tweezing talent. Thank you for this tip, have added Tweezerman to my shopping list!I now have a great eyebrow pencil that sorts out the dreadful gaps my aforementioned lack of tweezing talent produces and leave the rest up to the wonderful ladies who I go to for threading once a month! Getting an eyebrow kit [mine’s a Sleek one] has had to be one of my best investments beauty wise. I never thought it would actually do much but man just it help define and shape my brows! I had a mixed experience with the Harvey Nichols threading ladies (http://mylifeinthings.blogspot.co.uk/2012/02/whats-in-box-1-pass-coathanger.html) but I recently had them done for £5 at Superdrug and was much happier with the outcome. I fear the Dennis Healeys too – that’s what happened to my aunt. ooooooh Superdrug eh, might look into that! I actually cackled out loud a few times during this one, well done. I have ridiculous brows. They are naturally CURLY (why? What have I done to deserve this? I hate you world) and are also ridiculously pale, as are my eyelashes, so I have to dye the bastards on top of all the rest of it. In fact, after letting the colour grow out for a few months (due to laziness/cheapness), I finally dyed them yesterday… and realised just how atrocious my plucking job had been. I can get away with just taking out the worst offenders when they’re pale, but the minute they turned dark brown I morphed into Liam Gallagher, awful. I need to buy some brow setting gel/clear mascara. I too look like a Gallagher brother if i don’t give my eyebrows attention. I once had a mishap with tiny mr mascara cut throat razors and chopped half my brow off, i stick to sharp scissors these days. I use the same tools when I’m trimming my eyebrows except for the number 2 item.